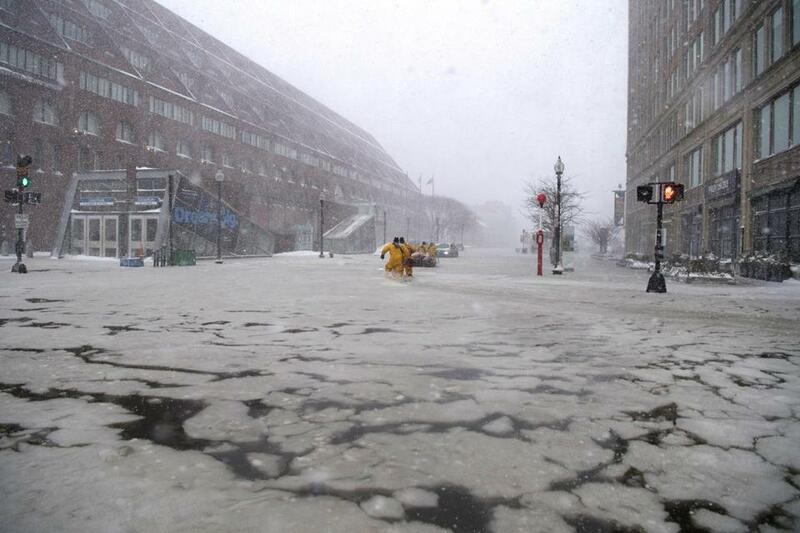 A Boston firefighter waded through flood waters from Boston Harbor on Long Wharf in Boston. With its gradually sinking, low-lying lands, and development right up to the water’s edge, Boston has long been considered uncommonly vulnerable to rising sea levels. But that long-term climate forecast became bracingly immediate on Thursday when a powerful winter storm, of a type known to meteorologists as the bomb cyclone, whipped up a record tide that sent waves surging through the streets of downtown Boston. City officials have begun planning for the worst in recent years, driven by projections that as much as 30 percent of city land could be submerged by the end of the century. Still, many were stunned by the sight of water inundating large swaths of the city’s waterfront Thursday, even as they warned that it could become all too familiar in the years to come. “What we saw yesterday is absolutely more of what we should expect in the future,” said Bud Ris, a senior adviser to the Boston Green Ribbon Commission, which has been working with city officials to devise strategies to cope with climate change. Without significant cuts in global carbon emissions, seas could rise as much as 10 feet by the end of the century, recent studies predict. In response, city officials have been working with scientists on ways to defend the city against the threat. Options include relatively inexpensive changes that they’ve already budgeted for — such as installing portable floodwalls in East Boston to elevating vulnerable streets in Charlestown — as well as the more ambitious and expensive. The city has commissioned studies on the feasibility of building large berms around South Boston and erecting a massive, multibillion-dollar sea barrier in Boston Harbor that could rise some 25 feet over the ocean surface and extend from Hull to Deer Island. A 2016 study by scientists at the University of Massachusetts and other local universities found that consequences of climate change could prove more calamitous to Boston than previous studies have suggested. That study found that sea levels could rise 10 feet by the end of the century and 37 feet by 2200 — nearly double what had been previously predicted. That projection was based in part on new research that suggests the accelerating melt of the ice sheets covering Antarctica will have a disproportionate impact on cities along the East Coast. “Boston is a bull’s-eye for more sea level damage,” said Rob DeConto, a climate scientist at UMass Amherst, who co-wrote the new Boston report. To defend the city against rising seas, officials must take a range of actions, scientists and environmental advocates say. They include changing the way developers build, especially in flood prone areas; securing vital systems such as sewers, drinking water, subway tunnels, and roads; updating evacuation routes; elevating some roads and buildings; and ultimately building water-blocking berms that could also serve as parks. Last fall, the city published a report on “coastal resilience” plans for East Boston and Charlestown, which proposed ways of defending the most vulnerable parts of the city. These options included a temporary floodwall that could be deployed at the mouth of the East Boston Greenway extending to a new park behind the Schrafft’s Center in Charlestown’s low-lying Sullivan Square. The report estimated the proposed defenses would cost about $200 million over the next several decades in East Boston, and $62 million in Charlestown, seeking to prevent property damage that could cost far more. The city recently launched a similar report for South Boston, Fort Point, and the Seaport, where scientists predict nearly one-quarter of the neighborhood could be exposed to flooding as seas rise another 9 inches. The Boston Planning & Development Agency recently began asking developers to complete a detailed survey of potential climate impact on their projects. While developers aren’t yet required to incorporate defenses against rising seas into their plans, they’re strongly encouraged to do so, said Rich McGuinness, the agency’s deputy director of waterfront planning. But as wharves were submerged along the downtown waterfront and icy rivers flowed through the alleys of Fort Point on Thursday, the real challenge is protecting the places Bostonians have lived since long before rising seas were a concern. As old buildings in low-lying neighborhoods are renovated, some owners are abandoning basement space or moving mechanical systems to higher floors. New zoning planned for the downtown waterfront would allow building owners to make buildings taller if they move systems out of floodable basements, McGuinness said. 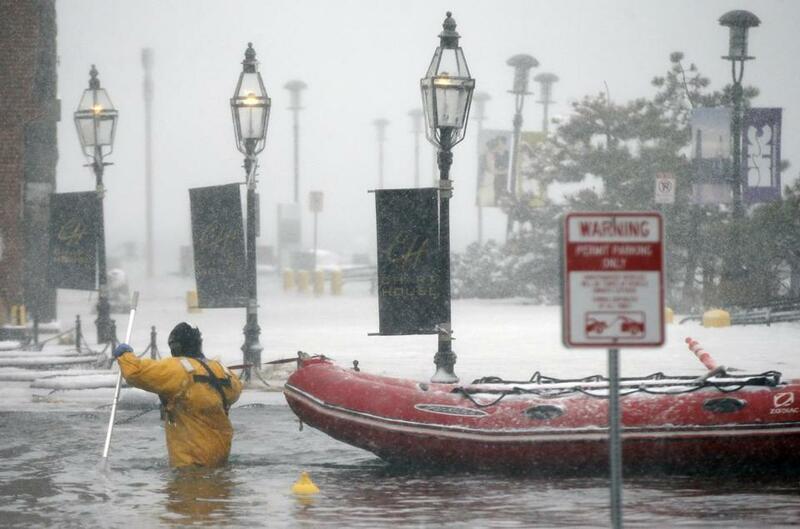 Rescue workers waded through deep water to help a stranded motorist in front of the Marriott Long Wharf Thursday. Many of the newer buildings in the Seaport and along East Boston’s waterfront weathered the floods with little problem. Many were designed with rising seas in mind, with mechanical systems on the roofs instead of basements, for instance, and sites that have been landscaped to sit several feet above natural ground level. That kept Seaport Square, for instance, “high and dry,” said Yanni Tsipis, senior vice president for WS Development, which is building the 23-acre complex of apartments, office buildings, and stores along Seaport Boulevard. Still, many of those buildings may not be sufficiently protected to deal with future flooding that could make Thursday’s storm seem minor. Bradley Campbell, the president of the Conservation Law Foundation, urged city and state officials to do more.